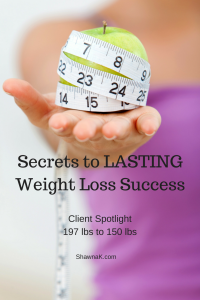 Ever wonder why some people can drop the weight and keep it off? while others yo-yo back and forth or never achieve any weight loss whatsoever? Meet my client and now friend, Lori O. She started her weight loss journey at 197 lbs at only five foot four inches. She finally decided that ‘enough was enough’ after trying what she describes as ‘everything’ to drop the weight. She now sits comfortably below 150 lbs. She’s come to realize the irrelevance of number on the scale; she has transformed her body to be in the absolute best shape and most fittest condition of her life at age 55. I wanted to share some of her ‘secrets of success’…. 🤔It seems that Lori had a mind shift where she was simply READY to make lasting change. She came to the realization that the excuses that she was ‘too busy’ or ‘had no time’ to take care of herself really weren’t valid at all. Turns out that even now that she’s developed healthy habits, no extra time has magically appeared on her calendar – she now MAKES time for healthy pursuits. Listen in as Lori describes how she ‘stayed the course’ even during the times that she saw NO changes on the scale. I like to think of Lori as a ‘super star‘ because of her ability to connect the dots of health. She can see how her behavior effects how her body reacts, and feels. She seems to think that she’s nothing special, but I can tell you she is WRONG 😉 She’s really something else! 💥Lori exemplifies a woman who has prioritized her health in a HEALTHY way; she’s not a fitness fanatic making too many changes too soon. She paces herself. She allows herself to take a day off, eat a slice of pie or enjoy a glass of wine from time to time. Lori exercises balance and takes care of other areas of her life in addition to her nutrition and fitness. If you’re local to NW Calgary, please reach out and try a few sessions for free so you can experience just a taste of what Lori has experienced. It’s likely that she’ll be there sweating and smiling and encouraging you on….